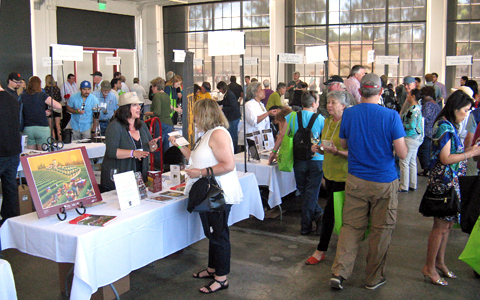 Report on the 8th Annual Taste of Mendocino, held on Saturday, June 25th, 2016, at Gallery 308 at Fort Mason in San Francisco, California. The event features an extensive tasting of wines sourced from vineyards throughout Mendocino County. Taste of Mendocino is more than just a wine tasting event – it’s been described as a “showcase of all the people and products that make Mendocino County such a special destination for wine lovers, outdoor enthusiasts and rebels.” The event was presented again this year by Mendocino Winegrowers, Inc. and Visit Mendocino County. Mendocino County promotes itself as “America’s Greenest Wine Region.” The county features the nation’s first organic winery (Frey Vineyards), first solar-powered winery (McDowell Valley Vineyards), first carbon-neutral winery (Parducci), first 100% “off-grid” winery (Philo Ridge), California’s largest certified organic grape grower (Fetzer), and the nation’s largest producer of organic wine (Bonterra). Over 20% of Mendocino’s winegrapes are grown in certified organic or biodynamic vineyards – one of the leaders in the country. The county’s wine history goes back to the 1850s, when the first vineyards were planted, and the first Mendocino County winery was established in 1879. Today, the county includes 11 separate AVAs, and is home to over 100 bonded wineries and nearly 19,000 acres planted among over 500 vineyards. Taste of Mendocino is a unique event meant to showcase the best of Mendocino County, bringing together not only wineries but representatives from many other businesses as well. 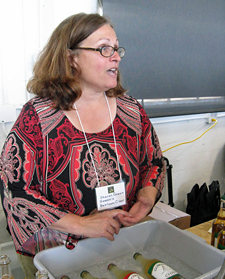 Tables at the event also included those for food purveyors and growers – including coffee, honey, cheese, olive oil, pies, and chocolates – visitor agencies, and other local attractions and businesses – a great showcase for the diversity of Mendocino County. I had missed last year’s event so I was particularly looking forward to this one. This was the first time since I’ve been attending Taste of Mendocino that it was held on a weekend, and perhaps as a result of that, it drew a good crowd this year. This year’s event was in a different venue from the past few years, moving from the Golden Gate Club at the San Francisco Presidio to Gallery 308 at Fort Mason. Parking and access by public transit are both easier in the new location. It’s a somewhat smaller space than the previous one, however, so fewer wineries poured this year than in the past. A total of 26 wineries were listed to pour at this year’s Taste of Mendocino, but there were three of those producers who weren’t there at the tasting and another I missed since they left early. The upside to fewer producers pouring was that I got to taste at nearly all the winery tables this year, including those of a number of producers with which I had little or no experience. I even had time to try the very good Gowan’s Hard Cider! I tasted wines from 20 producers in all. I skipped Murder Ridge and Theopolis since I’d tasted their wines at a recent event – and their wines are highly recommended, by the way. 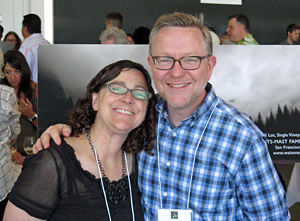 Taste of Mendocino always attracts a fine cross-section of vintners from the county. Mendocino County is a particularly diverse winegrape-growing region, and I imagine that getting wineries from all over the county to participate is no small feat. The wines from areas closer to the coast such as Anderson Valley and Mendocino Ridge are quite different than those from Yorkville Highlands, Redwood Valley, and Potter Valley – and wines from all of those individual regions are distinct from one another too. As has been the case at past Taste of Mendocino events, my list of Favorites reflects the diversity of wines from Mendocino County, in terms of both wine regions and grape varieties. While my top white wines of the tasting were quite varied, the top reds were all Pinot Noirs and Zinfandels, though more varieties are represented in the “Others of Note” category. Looking at past tastings, I can see that part of the narrowed varietal focus among my Favorite reds was due to several fine producers from past events not pouring this year, including Alder Springs, Drew, Skylark, and Testa. There’s still a solid group of Favorites, though I felt the wines I tasted this year were a bit more hit and miss than in the past. I think this was partly because I tried out more producers that were new to me, so there were bound to be some I enjoyed more than others. Several producers stood out at this year’s tasting, including Husch, Navarro, and Waits-Mast. Two producers that were new to me – Panthea and Pennyroyal – also presented particularly strong wine line-ups. Edmeades and Phillips Hill also poured noteworthy groups of wines, and a number of other producers had at least one standout wine at the tasting. 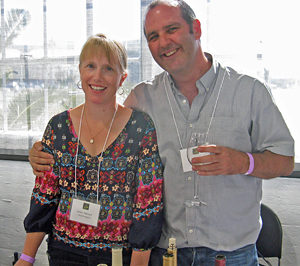 Taste of Mendocino is a fun event, with much more to check out than just wineries. It presents a good overview of the county’s many attractions in an intimate and relaxed format. The theme of this year’s event was “Small Farms, Big Flavors” – very appropriate for Mendocino, where smaller family farms are the rule. As usual, there were plenty of good wines poured at the tasting, representing a broad range of varieties, styles, and price ranges. 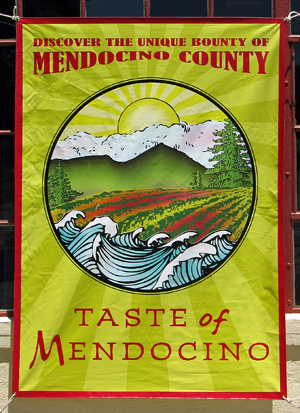 Taste of Mendocino continues to be a fine showcase for Mendocino County, and I’m looking forward to their next event. Charlie Barra is a legendary grower in Redwood Valley, where he started farming his estate vineyard in 1955. The Barra wine label was established in 1997. All of the fruit for the Barra wines and for sister label Girasole comes from the certified organic estate vineyard, and Jason Welch is the winemaker for both labels. I tasted five wines at the table – Girasole 2014 Chardonnay, Barra 2015 Estate Pinot Noir Rosé, Girasole 2014 Cabernet Sauvignon, Barra 2011 Estate Petite Sirah, and Barra 2013 Muscat Canelli. The Chardonnay featured bright apple fruit with hints of flowers and spice, lighter-bodied with a bright texture and clean, lively finish – nice value for a lighter Chardonnay. The Rosé had scents of watermelon and fresh herbs, with good acidity and a crisp finish. The Cabernet was lighter-weight than I’d expected, with upfront black cherry and spice on the nose, while the Petite Sirah displayed dark berry fruit, lots of chocolate, spice, and touches of flowers and black pepper, with plenty of structure and big but refined tannins. I saved the Muscat Canelli for the end – with floral and stone fruit aromas, medium acidity and a smooth, slightly sweet finish, it would work as a summer afternoon sipper. This was a good group of wines from Barra and Girasole. 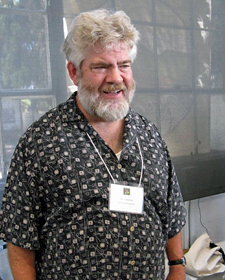 Dr. Donald Edmeades planted the first post-Prohibition commercial vineyard in Anderson Valley in 1963, and the Edmeades label was launched in 1972. Long-known for its Zinfandels, the winery has been owned by Jackson Family Wines since 1988. Ben Salazar has been the Edmeades winemaker since 2012. I tasted four of their wines – 2013 Mendocino County Zinfandel (86% Zinfandel, 10% Petite Sirah, 4% Syrah), 2013 Perli Vineyard Zinfandel, 2013 Gianoli Vineyard Zinfandel, and 2013 Shamrock Vineyard Zinfandel. Both the Perli and Gianoli vineyards are in the Mendocino Ridge AVA, while Shamrock is from a 2,800-foot elevation site near the Humboldt border. 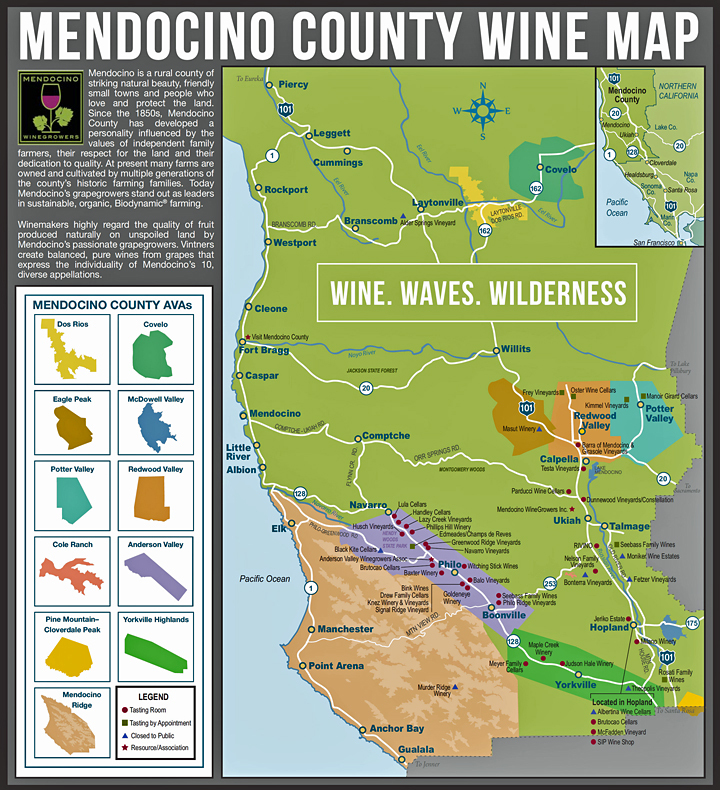 The Mendocino County bottling had lots of upfront spice, plus plum and darker berry fruit, chocolate, and a touch of sweet oak, with a fairly smooth texture and milder tannins. The Perli Vineyard Zin was my favorite of the four – plenty of black pepper along with blueberry, spice, and earth aromas, lively acidity, and fine tannins. The Gianoli Zin showed more vanilla/oak on the nose plus riper fruit and cloves, with good structure and firmer tannins. The Shamrock Vineyard Zin was my second favorite, less fruit-forward and displaying more earth, pepper, and spice with raspberry fruit in the background, more structured on the palate and somewhat chalky tannins that could use a couple of years to smooth out. 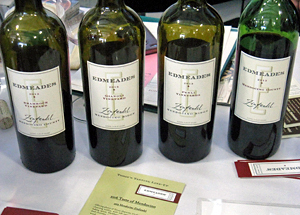 Edmeades always presents a good group of Zinfandels and they did not disappoint this year. 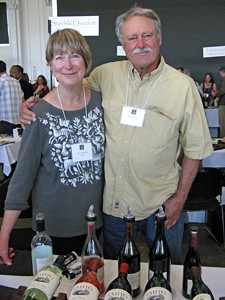 Paul and Beba Frey first planted their Redwood Valley ranch with winegrapes in the late 1960s. They and their family have been among the pioneers of organic (and later biodynamic) viticulture in California, and Frey was the country’s first producer of certified organic wines. All of the Frey wines are labeled as organic and contain no added sulfites. I tasted six Frey wines – 2014 “Biodynamic” Chardonnay, 2014 Sauvignon Blanc, 2015 Pinot Noir, 2014 Sangiovese, 2014 “Organic Agriculturist” (Carignane, Zinfandel, Merlot), and 2014 “Biodynamic” Zinfandel. The Chardonnay showed higher-toned pear and spice aromas along with a touch of lemonpeel, with moderate acidity and a fairly smooth finish. The Sauvignon Blanc, made entirely in stainless steel, had subtle melon and herb notes, with a smooth texture – could have used a bit more acidity. Of the four red wines, I felt the “Organic Agriculturist” and Sangiovese were considerably better than the other two. 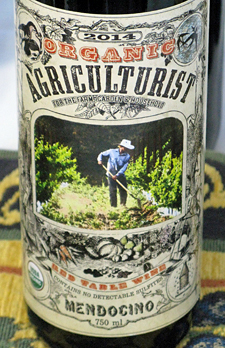 The earthy and rustic “Organic Agriculturist” had black cherry, plum, and herb aromas with plenty of structure and firm tannins, while the Sangiovese – my favorite of the Frey wines – featured bright cherry and spice on the nose, with lively acidity and a moderately tannic finish. Founded by Dan and Margaret Duckhorn of Napa Valley Merlot fame, Goldeneye has been making Pinot Noir from Anderson Valley since 1997. They now farm four estate vineyards in the valley – The Narrows, Split Rail, Gowan Creek, and Confluence. 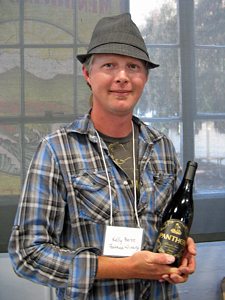 Michael Fay is the current winemaker, succeeding longtime Goldeneye winemaker Zach Rasmuson in 2012. 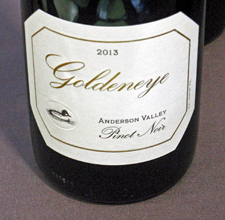 I tasted three wines at the Goldeneye table – 2015 Vin Gris of Pinot Noir, 2013 Anderson Valley Pinot Noir, and 2013 Gowan Creek Vineyard Pinot Noir. With fruit sourced from three vineyards and kept on the skins for 22 hours before pressing, the Vin Gris had lots of spice along with ripe red fruit and a lively texture. The Anderson Valley Pinot came from five vineyard sites, and aged in 53% new oak and 47% second-year French oak – this showed ripe black cherry, spice, coffee, an earthy note, and a framework of vanilla/oak, with a moderately rich mouthfeel and fine tannins. The Gowan Creek Pinot is planted to eight Pinot clones, and this wine was aged in aged in 60% new oak and 40% second-year French oak barrels. Riper and more intense black cherry and plum aromatics, with lots of spice and more noticeable sweet oak, plus a richer texture and firmer tannic finish – this should improve with time in the cellar. Goldeneye’s Pinots are on the bigger side for those from Anderson Valley – they’re very polished wines and will appeal to those who enjoy the style. Located between Philo and Navarro, Husch is the oldest winery in Anderson Valley – it was established by Tony and Gretchen Husch in 1971. The winery has been owned by the Oswald family since 1979. The current proprietors, Zac Robinson and Amanda Robinson Holstine, are the third generation of the Oswald family at Husch, and Brad Holstine and Jeff Jindra head up the winemaking team. Zac and Krista Robinson were on hand to pour their wines, and I tasted four of them – 2015 Vin Gris of Pinot Noir, 2014 Anderson Valley Chardonnay, 2013 Anderson Valley Pinot Noir, and 2013 Late Harvest Gewürztraminer. The very pleasant Vin Gris was pressed after 14 hours on the skins, and featured bright red fruit, earth, and slightly herbal notes, with a lively mouthfeel and clean finish. The Chardonnay was barrel-fermented, and showed pear and citrus, spice, and earth aromas, with medium body and a moderately creamy texture. The Pinot Noir, fermented with 25% whole clusters and aged in 25% new French oak, was very aromatic, with flowers and fresh cherries upfront along with spice, tea leaf, and a touch of sweet oak, medium-light weight with a fine tannins on the finish. I returned to the table at the end of the tasting to try the Late Harvest Gewürztraminer – at 11.5% alcohol and 22.5% residual sugar, the sweet apricot, honey, and spice components were balanced by plenty of acidity, and the finish was long and rich. Even though Husch did not pour a couple of wines I’ve particularly enjoyed in the past – their Sauvignon Blanc and Dry Gewürztraminer – they presented one of the stronger line-ups of the tasting. The Kimmel family purchased their ranch in Potter Valley in 1963, and matriarch Lillian and her three sons, Jim, Gary, and Dennis, run it today, with younger family members also joining in. The family had originally raised cattle on the ranch and planted their first winegrapes in 1986. The wines are made by Bruce Regalia, formerly with Goldeneye among others. I tasted four wines at the Kimmel table – 2013 Chardonnay, 2013 “Four Blocks” Merlot, 2013 “Four Blocks” Cabernet Sauvignon, and 2012 Cabernet Sauvignon. The Chardonnay, from the estate vineyard and fermented in French oak, had tropical fruit, flowers, and vanilla/oak aromas, with a smooth, creamy mouthfeel and finish. The “Four Blocks” line is for more value-priced wines. The “Four Blocks” Merlot was in an easy-drinking style, with fresh cherry and herb notes plus medium acidity and milder tannins. Of the two Cabernet Sauvignons, I preferred the “Four Blocks” bottling. This showed tobacco, black cherry, and earth on the nose, with a lively mouthfeel, fine tannins, and a stony mineral note on the finish – tasty and approachable now and with enough structure to age a few years too. 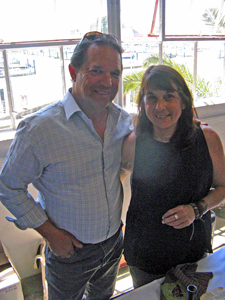 Founded in 2010, Lula is the project of veteran winemaker Jeff Hansen. He sources his Pinot fruit from two vineyards in Comptche area, a few miles north of Anderson Valley, and more recently planted a vineyard in the Philo area – the first harvest for that should be in 2015. The winery is named for Jeff’s grandmother. I tasted four wines at the Lula table – 2015 Rosato, 2014 Mariah Vineyard Zinfandel, 2013 Anderson Valley Pinot Noir, and 2013 Peterson Vineyard Pinot Noir. The Rosato is mostly from Pinot Noir and Zinfandel, and displayed ripe red fruit, spice, and a touch of herbs, with a lively mouthfeel and finish. The Zinfandel, from a site in the Mendocino Ridge AVA, had plum, spice, and black pepper aromas, with a structured mouthfeel and grippy finish. The Anderson Valley Pinot was made from four heritage selections, and showed cranberry, earth, and tea leaf on the nose, with moderate acidity and a lingering finish. The Peterson Vineyard Pinot Noir, from the Comptche area, was a step up, with strawberry, forest floor, savory herbal notes, and a hint of flowers, with good structure and bigger but refined tannins – nice now, but this deserves a few years in the cellar to develop further. Tom Rodrigues is the proprietor of Maple Creek, established in 2001, and its sister label Artevino. Tom’s artwork is on the Artevino labels, and he’s also created label art for other notable producers including Far Niente, Nickel and Nickel, Dolce, and Hamel Family Wines. The Maple Creek estate vineyard is in the Yorkville Highlands region. I tasted three wines – Maple Creek 2014 Estate “Reserve” Chardonnay, Artevino 2012 Weir Vineyard Pinot Noir, and Artevino 2011 Largo Ridge Zinfandel. The Chardonnay was fermented in French oak and aged on the lees, and showed subtle apple, spice, and vanilla/oak aromas with a moderately creamy texture and smooth finish. The Pinot, sourced from nearby Weir Vineyard, had earthy notes along with cherry and spice, with medium body and tannins. The Zin was aged in American oak, and featured ripe raspberry, spice, and pepper with vanilla/oak undertones, moderate acidity and firmer tannins. Dan and Vicki Dooling planted their first vines at their property in the remote Mendocino Ridge area in the 1980 and first started making their own wine in 1990. Dan was one of the key people behind creating the Mendocino Ridge AVA, and he coined the appropriate “Islands in the Sky” name for it. Mariah Vineyard is at about 2,500-foot elevation, and specializes in dry-farmed Sauvignon Blanc and Zinfandel. Dan and Vicki poured two their wines at the tasting – 2014 Sauvignon Blanc and 2013 Zinfandel (95% Zinfandel, 5% Petite Sirah). The Sauvignon Blanc, barrel-fermented in neutral oak with no malolactic fermentation, was a standout, with grapefruit, herb, and floral aromas, vibrant acidity, and a crisp finish. The Zin was aged in French oak and showed higher-toned cherry and wild berry notes with undertones of earth, pepper, and sweet oak, medium body and moderate tannins. One of the earlier modern Anderson Valley wineries, Navarro was established by Ted Bennett and Deborah Cahn. In 1974, they began planting their estate vineyard near Philo with Gewürztraminer, Pinot Noir, Riesling, Muscat, and Chardonnay. They’ve become one of Anderson Valley’s best-known wineries, and winemaker Jim Klein has been at Navarro since 1992. Jim Greaves, who’s been with the winery since 1996, poured me seven wines – 2015 Pinot Grigio, 2015 “Cuvée 128” Sauvignon Blanc, 2014 “Première Reserve” Chardonnay, 2014 “Deep End Blend” Riesling, 2014 Anderson Valley Pinot Noir, 2012 Cabernet Sauvignon, and 2015 Rosé of Pinot Noir. As I’ve often found with Navarro, the whites are really the stars of the show. Although the pear, citrus, and herb-scented Sauvignon Blanc and the spicy and buttery yet lively Chardonnay were both good, the other two whites were highlights. The Pinot Grigio showed aromas of apple, pear, and flowers, with undertones of spice, a vibrant mouthfeel and crisp finish. The Riesling had characteristic petrol and stone fruit notes and the zippy acidity balanced a slight hint of sweetness on the finish, very nice. 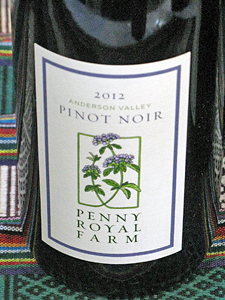 The Pinot Noir was a blend from a number of Anderson Valley sites, with about 50% from Navarro’s estate vineyard. With rhubarb, cherry, earth, and tea leaf aromas, a lighter body and lively finish, this is a good choice for near-term drinking. The Cabernet fruit came from Berry Vineyard in the Ukiah area, and the wine displayed plenty of herbal notes along with ripe plum and currant fruit, with medium weight and fine tannins. My last wine was the Rosé – another winner, with strawberry, flowers, and spice on the nose, with lively acidity and a clean finish. But I wasn’t quite finished – I mentioned to Jim that I’ve always enjoyed Navarro’s grape juice but hadn’t tried any in awhile, and sure enough, he pulled a bottle of 2015 Pinot Noir Grape Juice from a cooler behind the table. Red fruit, rhubarb, and spice, and not too sweet, just like I remembered it! Navarro continues to produce some of the best and most consistent wines from Anderson Valley. Panthea is a small family operation launched with the 2010 vintage by vintner Kelly Boss and his wife Jessa. Panthea specializes in Anderson Valley Pinot Noir, and they have their own 2.5-acre estate vineyard in the Philo area (adjacent to noted Klindt Vineyard) planted mostly to Pommard and 667 clones. Kelly was behind the table for the event and poured me four of his wines – 2012 “Siren” Pinot Noir, 2012 Filigreen Vineyard Pinot Noir, 2012 Klindt Vineyard Pinot Noir, and 2012 Estate Pinot Noir. All of the wines are fermented with native yeast. The “Siren” bottling was sourced from Filigreen and Helluva vineyards and featured tart red fruit, spice, and a touch of earth, with medium body and fairly mild tannins. The Filigreen Vineyard Pinot was my favorite of the four, with aromas of black cherry and plum, earth, tea leaf, and undertones of spice and sweet oak, with a more structured mouthfeel and finish. The Klindt Vineyard Pinot displayed black cherry, forest floor, and spice, with a bit bigger body and firmer tannic finish. The Estate Pinot was another highlight, with red fruit, flowers, tea leaf, and earth aromas, good structure and refined tannins – this will be one to age for a few years. Very good wines from this fairly new producer. Parducci Wine Cellars is located just north of Ukiah, and was founded in 1932. The Parducci family has not been involved with the label since the 1990s, and there have been ownership changes since then. Bob Swain is the winemaker. I tried four wines at the Parducci table – 2014 “True Grit Reserve” Chardonnay, 2012 “True Grit Reserve Red” (65% Syrah, 25% Zinfandel, 10% Petite Sirah), 2014 Cabernet Sauvignon (98% Cabernet Sauvignon, 2% Petit Verdot), and 2013 Petite Sirah. The Chardonnay, aged in 100% new French oak, showed apple and spice notes though an odd oak character detracted from the aromatics. The “Reserve Red” had spicy and peppery dark berry fruit, earth, and sweet oak on the nose, and a moderately rich texture and finish. I preferred the last two wines, which I felt showed a lighter winemaking touch. The Cabernet displayed plum and darker berry fruit, herbs, olives, and touches of spice and earth, with a structured mouthfeel and grippy tannins, while the Petite Sirah had plenty of black pepper aromas plus blackberry, flowers, earth, and spice notes, with full body and a firmly tannic finish. Both the Cab and Petite Sirah should benefit from cellaring for a couple of years. Located in the Boonville area, Pennyroyal Farm was established in 2012 and specializes in both wine from their estate vineyard and cheese from their goats and sheep. The vineyard is planted to 7 acres of Sauvignon Blanc and 15 acres of Pinot Noir. A sister winery of Navarro Vineyards, Sarah Cahn Bennett is the Pennyroyal Farm co-owner and winemaker. She was on hand to pour three of her wines – 2014 Sauvignon Blanc, 2015 Rosé of Pinot Noir, and 2012 Pinot Noir. The Sauvignon Blanc displayed bright citrus fruit plus floral and herbal notes, with a fairly smooth texture and finish. The Rosé was quite nice, with watermelon and savory herbal aromas along with a hint of flowers, vibrant acidity and a crisp finish. The highlight was the 2012 Pinot Noir – very floral with strawberry and rhubarb notes along with subtle spice and tea leaf undertones, a lively mouthfeel and fine tannins. While this could age for a few years, there’s no need to wait on this fine young Anderson Valley Pinot. Very nice wines from this newer venture. Founded in 2002 by vintner Toby Hill, the winery is on Greenwood Ridge west of Anderson Valley, and there are plans for a Phillips Hill estate vineyard. There is a tasting room just outside of Philo. The main focus is on Pinot Noir, and the winery also produces Riesling, Gewürztraminer, and Chardonnay. I tasted four wines at the Phillips Hill table – 2015 Valley Foothills Vineyard Gewürztraminer, 2014 “Boontling” Pinot Noir, 2013 Valenti Vineyard Pinot Noir, and 2013 Oppenlander Vineyard Pinot Noir. The Gewürztraminer was very pleasant, with subtle lychee and spice aromas, a light and lively texture, and just a hint of sweetness on the finish. The “Boontling” Pinot is a blend from vineyard sources in Anderson Valley and Comptche, and featured strawberry, rhubarb, earth, and spice on the nose, with a medium-light mouthfeel and fine tannins. The Valenti Pinot, from a site in the Mendocino Ridge area, had lots of upfront spice along with red fruit and tea leaf notes, with lively acidity and moderate tannins. The Oppenlander was my favorite of the three Pinot Noirs – black cherry, pepper, forest floor, and spice on the nose with more structure on the palate and firm tannins that could use a couple of years to mellow. This was a good line-up of wines from Phillips Hill. Philo Ridge proprietors Fred Buonanno and Heather McKelvey purchased the vineyard and winery site of the old Christine Woods Winery in 1999, and Norman Kobler directed new plantings there in 2000. 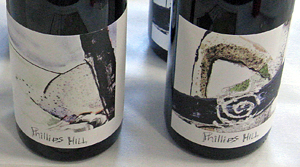 Heather is the winemaker, and the first Philo Ridge wines were released in 2004. I didn’t intend to taste as many wines as I did – nine of them! Fred poured me the 2014 Nelson Ranch Pinot Gris, 2014 Ferrington Vineyard Dry Gewürztraminer, 2014 Haiku Vineyard Chardonnay, 2014 Nelson Ranch Viognier, 2012 Anderson Valley Pinot Noir, NV “Vino di Mendocino IV” (50% Zinfandel, 20% Syrah, 15% Petite Sirah, 15% Carignane), 2013 Vittorio’s Vineyard Primitivo, 2012 Firebrick Vineyard Zinfandel, and 2008 “Coro Mendocino” (51% Zinfandel, 49% Petite Sirah). Of the whites, my two favorites were the Gewürztraminer and the Chardonnay. The Gewürztraminer featured classic aromas of lychee, flowers, and spice, with good acidity and a long finish, while the Chardonnay – fermented in stainless steel and aged in neutral oak – showed bright pear and tropical fruit notes with a lively mouthfeel and clean finish. The Pinot Noir, from 115, 667, 777, 2A, and Pommard clones at Ferrington and Philo Ridge vineyards, had upfront spice and vanilla/oak aromas along with cherry and earth, with medium-light body and fairly smooth texture. Of the two Zin-based blends, the “Coro Mendocino” exhibited too much band-aid aroma associated with brett, while the “Vino de Mendocino IV” was light, bright, earthy, and spicy. And while the lighter-bodied Primitivo was pleasant, with black cherry and spice notes, the Zinfandel was a step up, with black cherry and raspberry fruit, brambly and peppery notes, and spice, medium weight with moderate tannins – drinking nicely right now. 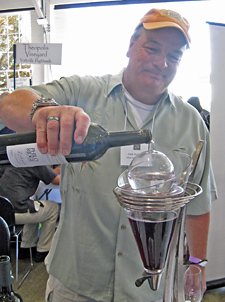 And it helped that Fred used a wild-looking aerator/decanter for the Zin too! Roadhouse was launched with the 2008 vintage by Eric Hall, who is also one of the organizers of the annual Pinot on the River event in Russian River Valley. Not surprisingly, the focus of the winery is Pinot Noir, though they also produce small lots of Chardonnay, Zinfandel, and Cabernet Sauvignon. A three-vintage vertical was poured at the tasting – 2012 Weir Vineyard Pinot Noir, 2013 Weir Vineyard Pinot Noir, and 2014 Weir Vineyard Pinot Noir (pre-release). These wines are all from fruit grown at Weir Vineyard in the Yorkville Highlands – the 2012 was the first year that Roadhouse worked with the vineyard. The 2012 Pinot featured ripe and intense black cherry fruit, spice, and sweet oak on the nose, with a moderately rich texture and finish. The 2013 was my favorite of the three, even though the vanilla/oak component was more prominent, along with aromas of black cherry, cola, and earth, and with brighter acidity and better structure than the 2012. The 2014 had more of a sour cherry profile, plus earthy, leathery notes, firm structure and a chalky tannic finish. John Scharffenberger established his eponymous label in 1981, and it’s been owned since 2004 by Maisons Marques & Domaines, which also owns Roederer Estate. Like Roederer, Scharffenberger is known for its sparkling wines but makes a little still Pinot Noir as well. Tex Sawyer has been the winemaker at Scharffenberger since 1989. 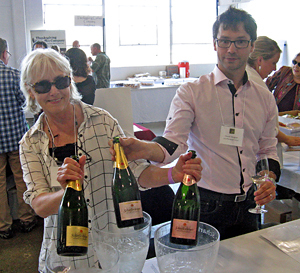 Sharon Sullivan and Claude Rouguet were behind the winery table, and they poured me three wines – NV Brut Rosé “Excellence” (51% Pinot Noir, 49% Chardonnay), NV Brut “Excellence” (60% Chardonnay, 40% Pinot Noir), and NV Crémant (50% Chardonnay, 50% Pinot Noir). The two “Excellence” sparklers, both made by the traditional Méthode Champenoise, form most of Scharffenberger’s production. The Brut Rosé has a small percentage of Pinot Noir wine added to the blend prior to the second fermentation in the bottle. This had strawberry, earth, and slightly floral notes, with fine bubbles and a crisp finish. I preferred the Brut, with its bright apple, citrus, and yeasty, leesy aromas, creamier texture, and very fine bubbles. The Crémant is made in an off-dry style, with a higher dosage. This featured stone fruit and tropical fruit on the nose, and a moderately creamy mouthfeel with less noticeable bubbles – a good summer afternoon sparkler. All three wines are reasonable value for “everyday” sparkling wines. Seebass has been growing winegrapes for over 25 years but only recently began producing its own wines. The vineyard is located just east of Ukiah, and is planted to Chardonnay, Grenache, Merlot, Syrah, and Zinfandel, including some Zin vines that are over a century old. I tasted two Seebass wines – 2013 “Romantik” (50% each Grenache and Syrah), and 2015 “Fantasie” Grenache Rosé. The “Romantik” was a straightforward red blend, showing red cherry and spice notes, with moderate acidity and tannins. The “Fantasie” was a bit more interesting, with bright strawberry, floral, and earth aromas and a lively mouthfeel and finish. Tahto is the label of Wayne Bauer and Anne McAfee, who purchased property in Potter Valley in the late 1990s and planted Sauvignon Blanc there. Wayne has been making wine since the early 1980s and sources fruit for the Tahto wines from nearby Ukiah Valley and Redwood Valley as well as Potter Valley. Both Wayne and Anne were on hand to pour their wines, and I tasted four of them – 2015 Sauvignon Blanc, 2015 Rosé, 2013 Syrah, and 2012 Petite Sirah. The Sauvignon Blanc comes from the estate Bauer Vineyard in Potter Valley, and had a light greenish-straw color, with grapefruit, herb, and floral aromas, a lively mouthfeel, and clean finish – my favorite of the Tahto wines. The Rosé, from Trails End Vineyard in Potter Valley, is mostly from Grenache plus a little Syrah – slightly floral with red fruit and spice on the nose, with moderate acidity and a smooth finish. The Syrah, from Piffero Vineyard in Redwood Valley, featured blackberry, smoke, herbs, and sweet oak, with medium weight and firm tannins on the finish. The Petite Sirah, from Johnson Vineyard in Ukiah Valley, had ripe dark berry fruit aromas along with lots of spice, a bit of chocolate, and vanilla/oak, a rich mouthfeel with a tangy finish. Jennifer Waits & Brian Mast established their winery in 2005, and they focus on Pinot Noir sourced from Anderson Valley, Mendocino Ridge, and Comptche. The wines are made in San Francisco, and use destemmed fruit fermented with native yeast and typically aged in 25-30% new French oak. Shalini Sekhar is the consulting winemaker. (Disclosure – I’ve helped out with bottling for Waits-Mast) Both Jennifer and Brian were behind their winery table, and they poured five wines for me – 2015 Rosé of Pinot Noir, 2014 Mendocino County Pinot Noir, 2013 Oppenlander Vineyard Pinot Noir, 2013 Mariah Vineyard Pinot Noir, and 2012 Oppenlander Vineyard Pinot Noir. The Rosé is a saignée of fruit from Nash Mill Vineyard in Anderson Valley and Mariah Vineyard in Mendocino Ridge. Featuring fresh strawberry, lots of spice, and a floral note, this had a clean, smooth mouthfeel and finish. The Mendocino County Pinot fruit was sourced from Mariah and Oppenlander vineyards age the wine was aged entirely in neutral oak – this had bright, ripe cherry aromas plus tea leaf and herb notes with a hint of flowers, medium weight and a chalky mineral note on the finish, quite nice. The 2013 Oppenlander Pinot was even better – from a site near the small and remote town of Comptche, it displayed an earthier character along with black cherry, spice, forest floor, and a light touch of sweet oak, with a more structured mouthfeel and fine tannins. The 2012 Oppenlander showed more upfront ripe fruit and spice, with a similar structure and finish to the 2013 vintage. The Mariah Pinot, aged in 25% new French oak, had cherry and rhubarb scents with savory and earthy undertones and vanilla/oak in the background – with plenty of structure and firmer tannins, this is one to lay down for a few years. A very good showing for the Waits-Mast wines.